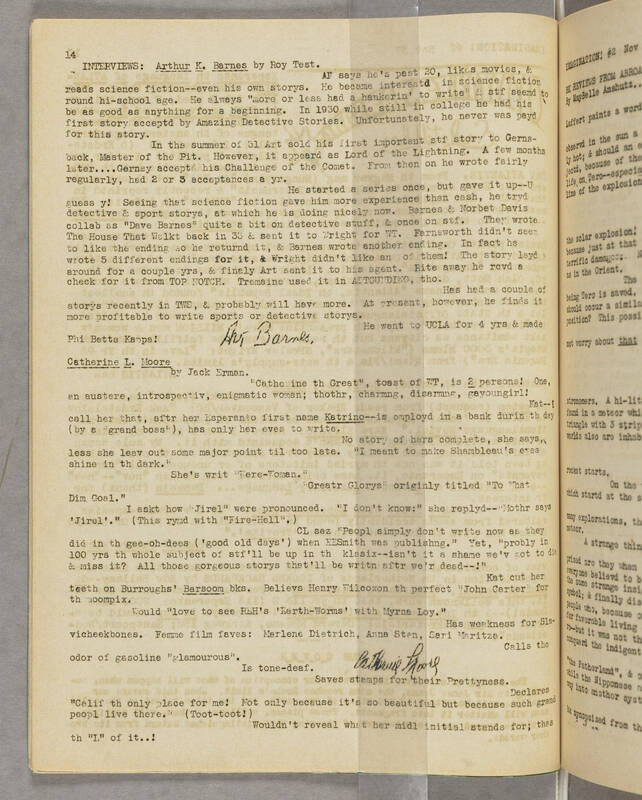 14 INTERVIEWS: [underlined] Arthur K. Barnes by Roy Test. AB says he's past 20, likes movies, & reads science fiction--even his own storys. He became interstd in science fiction round hi-school age. He always "more or less had a hankerin' to write" & stf seemd be as good as anything for a beginning. In 1930 while still in college he had his first story acceptd by Amazing Detective Stories. Unfortunately, he never was payd for this story. In the summer of 31 Art sold his first important stf story to Gernsback, Master of the Pit. However, it appeard as Lord of the Lightning. A few months later....Gernsy acceptd his Challenge of the Comet. From then on he wrote fairly regularly, had 2 or 3 acceptances a yr. He started a series once, but gave it up--U guess y! Seeing that science fiction gave him more experience than cash, he tryd detective & sport storys, at which he is doing nicely now. Barns & Norbet Davis collab as "Dave Barnes" quite a bit on detective stuff, & once on stf. They wrote The House that Walkt back in 33 & sent it to Wright for WT. Farnsworth didn't seem to like the ending so he returnd it, & Barnes wrote another ending. In fact he wrote 5 different endings for it, & Wright didn't like an[y] of them! The story layd around for a couple yrs, & finaly Art sent it to his agent. Rite away he rcvd a check for it from TOP NOTCH. Tremaine used it in ASTOUNDING, tho. Has had a couple of storys recently in TWS, & probably will have more. At present, however, he finds it more profitable to write sports or detective storys. He went to UCLA for 4 yrs & made Phi Betta Kappa! [signed] Art Barnes. [underlined] Catherine L. Moore by Jack Erman. "Catherine the Great", toast of WT, is [underlined] 2 persons! One, an austere, introspectiv, enigmatic woman; thothr, charmng, disarmng, gayoungirl! Kat--I call her that, aftr her Esperanto first name [underlined] Katrino--is employd in a bank durin th day (by a "grand boss"), has only her eves to write. No story of hers complete, she says, less she leav out some major point til too late. "I meant to make Shamleau's eyes shine in th dark." She's writ "Were-Woman." "Greatr Glorys" originly tilted "To What Dim Goal." I askt how "Jirel" were pronounced. "I don't know:" she replyd--"Mothr says "'Jirel'." (This rymd with "Fire-Hell".) CL sez "People simply don't write now as they did in th gee-oh-dees ('good old days') when KESmith was publishng.." Yet, "probly in 100 yrs th whole subject of stf'll be up in th klasix--isn't it a shame we'v got to die & miss it? All those gorgeous storys that'll be writn aftr we'r dead--!" Kat cut her teeth on Burroughs' [underlined] Barsoom bks. Believs Henry Wilcoxon th perfect "John Carter" for th moompix. Would "love to see REH's 'Earth-Worms' with Myrna Loy." Has weakness for Slavicheekbones. Femme film faves: Marlene Dietrich, Anna Sten, Sari Maritza. Calls the odor of gasoline "glamourous." Is tone-deaf. [signed] Catherine Moore Saves stamps for their Prettyness. Declares "Calif th only place for me! Not only because it's so beautiful but because such grand peopl live there." (Toot-toot!) Wouldn't reveal what her midl initial stands for; thes th "L" of it..!